This fantastic story will have children so caught up that their imaginations will work overtime picturing a little boy who is swept away by a huge wave and who finds himself on Robot Island. This audio story is the first in a two-part series written and narrated by Ann Twigg. The inspiration for this story came from her Grandson Tom, who was fascinated by robots. All children love action stories and this tale is brimming with it. When Tom is washed up onto a desert island, he thinks he is alone. However, he soon discovers that robots live on this island. Initially he’s very frightened, but his fear soon turns into excitement as the robots seem pleased to see him. 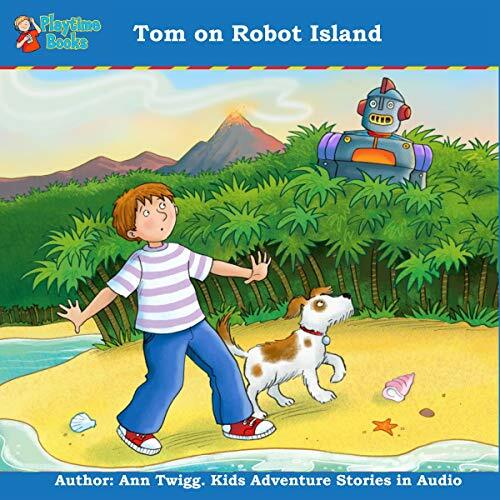 Tom soon realizes that the robots want to be his friend and are determined to help him escape the island and return home. The Robots on the island do lots of funny things, which make Tom laugh. Children listening to these adventure books will also find them delightful because of the comical actions of the robot characters. While many children might struggle to read books, audio books offer easy entrance into a new world at any time of the day. This audiobook is captivating and brilliantly narrated by Ann, who will have young children wanting to listen again and again. I’m Not a Robot! I’m Tom! I listened to this book alongside my 7 year old son who absolutely loves Robots. He has listened to it twice now and I am sure he will be listening again. He loves this story.